Since we moved in, I've been trying to kill the blackberry vine that grows between the sidewalk and street, reaching out thorny tendrils to catch unwary commuters. Every few months, I chop it back to the soil and rip out any roots I can find. It always grows back. The blackberry is incredibly invasive and almost unkillable once it's established. This may have something to do with a friend's confusion about the front yard. "Wait. You planted blackberries? On purpose?" 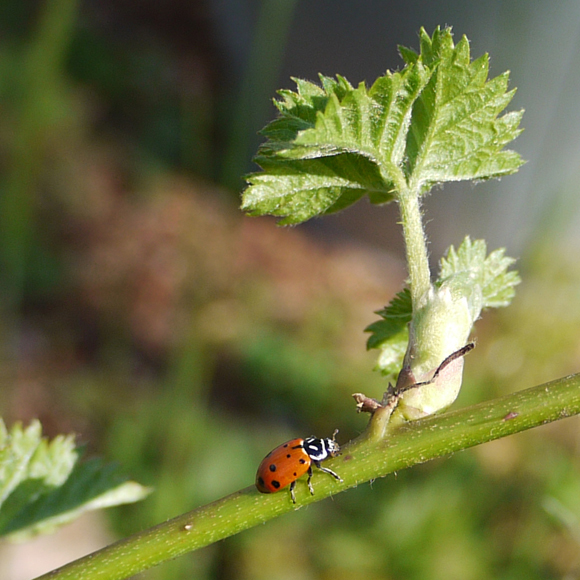 Ladybug, diligently patrolling the blackberries for aphids. Here's the redeeming thing about blackberry plants: they make blackberries. And I like blackberries a lot. The ones in the stores these days seem to have been grown for sturdiness rather than flavor, which doesn't stop them from being absurdly expensive. And although I know a lot of "urban foragers" are happy to harvest the thickets under the BART tracks, I worry about what the maintenance guys are spraying them with. 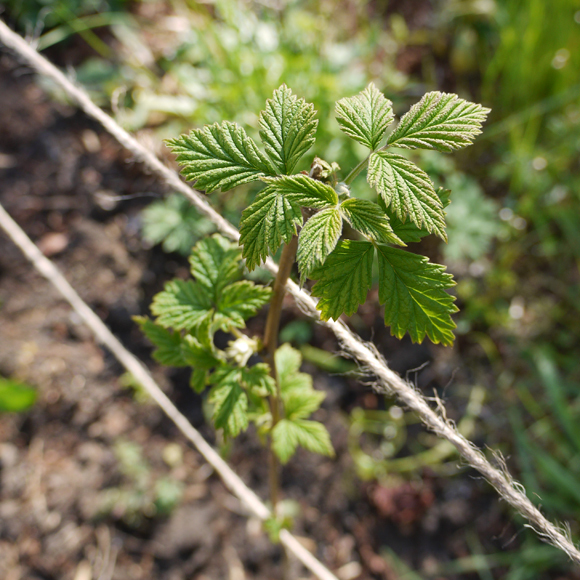 So last spring, with the help of some friends, I planted five blackberry plants and six raspberries in our front yard (I also like raspberries a great deal). Not having any idea which varieties would do best in my yard, I just got one of every bare-root variety that Berkeley Hort had in stock. The nursery guy said he liked the way I roll. One of the new raspberries. We didn't expect berries the first year, but got a dozen or so. 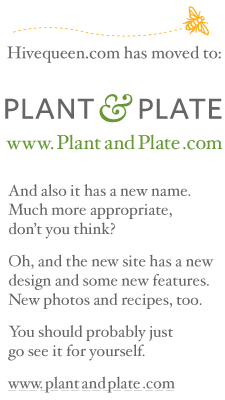 They were damned good, though I forgot to pay attention to which plants produced the tastiest fruit. I also neglected to water them much, figuring that this would encourage them to develop deep roots and build character. All that good stuff. Only two raspberries survived, but four blackberries did, which just goes to show you. The survivors spent the winter sending out runners. In theory, these should bear fruit this summer. 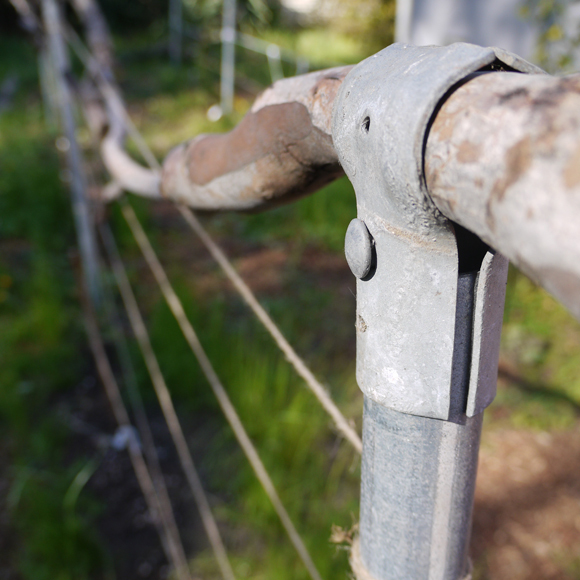 Unless they're trellised and diligently monitored, they will also root and spread until the plants take over the entire property. So after picking up and planting a few new varieties (including the "Loch Ness" blackberry – I'm a sucker for amusingly named produce), I put up trellises, tied the runners up, and gave everything a good watering. Trellises made from salvaged hardware, branches from the eucalyptus tree we had to take down, and my favorite brown twine. If I do this again, I need to learn to tie the right kind of knots. Four broccoli plants survived the wreckage of last year's garden. Despite being chopped down to the dirt and given no water for months, the roots sent up new growth this winter and have been producing a steady harvest of greens, plus a few tiny florets. Being moderately lactose intolerant, I'm always on the lookout for a better pseudo-milk. Unfortunately, most of the commercially available ones are sweetened, flavored, or both. Check the labels, even of the "Plain" varieties: unless they specifically say "unsweetened," most of them contain cane juice (a.k.a. sugar). Even my local grocery carries only one brand of unsweetened almond milk, and that one's vanilla flavored. No thanks – I like my coffee to taste like coffee. 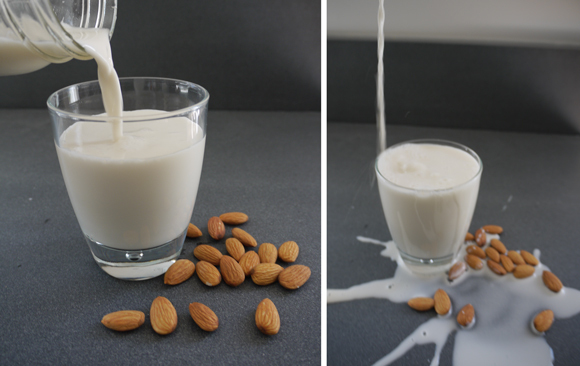 So I'm making my own almond milk. It's only about 5 minutes of actual work: just soak, blend, and strain. It's easier than I expected, and involves less cleanup than you'd think, unless you try to take a fancy photo of milk pouring into a glass from way up high without an assistant. Then it gets messy. Cover 1 cup of raw almonds with water and soak overnight. People say anywhere from 8 to 24 hours. Some refrigerate, some go at room temperature. 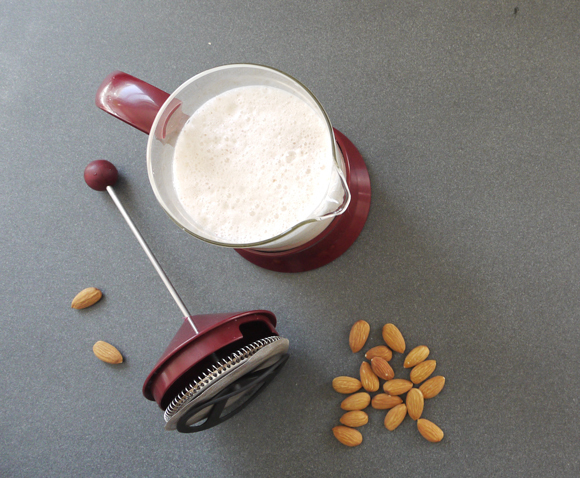 Put the almonds in your blender with 2 to 4 cups of fresh water. Less water will give you richer milk. I use 3 cups of water per cup of almonds. Puree until smooth and frothy. I suspect that you could get even more richness out by blending, letting it sit for an hour or two, then blending again. If you had that kind of patience. Pour the almond milk through a strainer lined with a tea towel. Squeeze out as much liquid as you can. If you just use a strainer, your milk will be somewhat grainy. This is fine for smoothies, okay for cereal, and not so good for coffee. You can also buy a "nut milk bag" or get creative. I have an extra french press and used that. Kind of tough to force down, but this batch was exceptionally smooth and creamy, and cleanup was a breeze. Don't throw away that almond meal! You can toast it in the oven and use it in baking, or... um... I guess you could make an exfoliating scrub out of it or something.